Directions: Use the SQRW (Survey-Question-Read-Write) Strategy to read the following informational article. Answer the questions and have the notes you have taken while reading this article reviewed by your parent or teacher. A cirrus cloud is a type of cloud comprised of ice crystals and characterized by thin, wisplike strands, often accompanied by tufts. Sometimes these wispy clouds are so extensive that they are virtually indistinguishable from one another, forming a veil or sheet called "cirrostratus". Sometimes convection at high altitudes produces another form of cirrus called "cirrocumulus" a pattern of small cloud tufts. The name "cirrus" is derived from a Latin word meaning "wisp of hair." Many cirrus clouds produce hairlike filaments made of the heavier ice crystals that precipitate from them. These "fall streaks", a form of virga, often indicate the difference in the motion of air (wind shear) between the upper part of the cirrus cloud and the air below it. Sometimes the top of the cirrus cloud is moving rapidly above a slower layer of air, or the streak is falling into a faster moving lower layer. The directions of these winds can also vary. Cirrus usually form at altitudes above 5000 meters (16,000 feet). The fall streaks may appear straight when wind shear is absent, giving the clouds the appearance of a comma (cirrus uncinus), or tangled, an indication of high-level turbulence. The falling ice crystals evaporate before reaching the ground. Cirrus clouds contribute both to the atmosphere's greenhouse effect and to the earth's albedo (the amount of sunlight the earth reflects); consequently it is not determined for certain whether the net effect of cirrus clouds is to warm or cool the earth. Much of the difficulty lies in modelling the albedo effect of clouds composed of various size and shape crystals. Older models tended to underestimate the albedo effect of cirrus. Refinements of these models will improve climate predictions. If there are many cirrus clouds in the sky it may be a sign that a frontal system or upper air disturbance is approaching. Cirrus clouds can also be the remnants of a thunderstorm. A large shield of cirrus and cirrostratus typically accompanies the high altitude outflow of hurricanes/typhoons. Q 1: When a bunch of the "strands" come together, they form a veil called a ...? 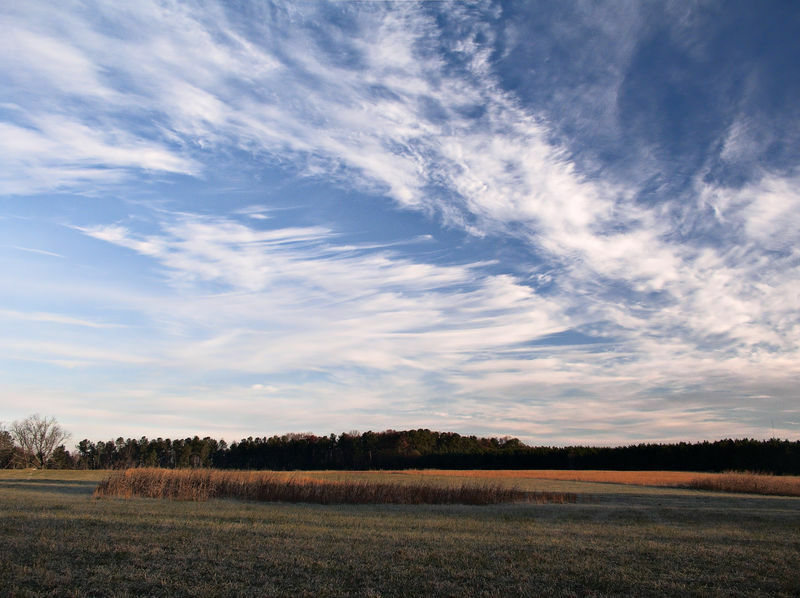 Q 2: Do cirrus clouds warm or cool the earth? Q 3: Many cirrus clouds in the sky may be an indicator of...? Several small storms may approach. A frontal system or upper air disturbance approaching. A fast and quick moving storm coming through. Q 4: What can the condition "virga" tell us? The warm air and the cold air will mix. There will be a lot of sunshine. A difference between the upper part of the cirrus cloud and the lower part.